As I got off the tube at Oxford Circus station on January 19, I spotted a group of excited young women holding some home-made banners. I hoped they were the Sixth Form students I had arranged to meet and bring to the start of the 3rd annual Women’s March held in London. I was right, and we made our way towards the meeting point for 50:50 Parliament supporters. There were an estimated 30 marches around the world this year – in countries as diverse as Jamaica, United States and Poland. The first global march in 2017 was held to protest the election of Donald Trump but each march covers a far broader range of issues, with violence against women topping the agenda this year. 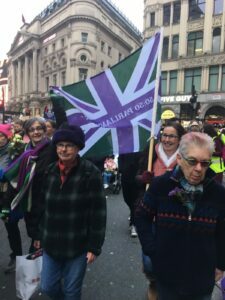 In London, the theme of this year’s march was “Bread and roses” in homage to the 1912 strike that revolutionised working women’s rights in the United States. After the Triangle Shirtwaist Factory fire of 1911 where 146 mainly female garment-industry workers died, Polish-born suffragette campaigner Rose Schneiderman said: “The worker must have bread, but she must have roses, too.” The message today is that austerity is worse for women, especially women who are already disadvantaged in society. As we marched the Sixth Form students created some of their own chants which were picked up by the rest of the crowd. I couldn’t believe this was their first protest as they were total professionals. The atmosphere was very positive, everyone seemed to be enjoying themselves. The march arrived in Trafalgar Square and moved towards the stage. The enthusiasm of organiser Dr Shola Mos-Shogbamimu as she took to the stage was infectious and she managed to make us forget the cold January temperature. “Time’s up for austerity!” she shouted, to a strong reaction of supportive whoops and cheers from the crowd. Highlights included a sing-and-dance along to Beyoncé and “I’m Every Woman.” At one point Shola encouraged the crowd to hold hands in unity. She also choreographed a group jump. I was nearly brought to tears by the stories of three girls from Islington Youth Council, as they recounted the misogynistic and homophobic abuse they had faced in public spaces. We also heard from Solace Women’s Aid of the dire situation of domestic violence victims with no recourse to public funds. The variety of speakers was very intersectional, dealing with colour, gender and class. Amanda Carpenter spoke for 50:50 and asked women in the crowd if they could nominate a friend to run for Parliament, and join the 400 women who have already visited our AskHerToStand page. It reminded me how society could be improved if our elected representatives included some of the individuals who took to the stage that afternoon. This is why I support a 50:50 Parliament, because equal seats mean equal say. Women must unite in their fight for equality, and an intersectional collaboration of different groups of women is the only way we can achieve this.